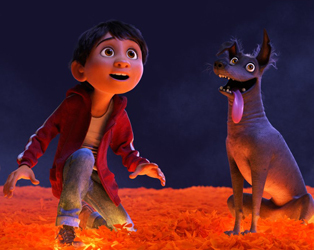 In Disney Pixar’s latest, COCO, aspiring musician Miguel (voiced by newcomer Anthony Gonzalez) teams up with charming trickster Hector (voice of Gael García Bernal) on an extraordinary journey through the Land of the Dead. In our collaboration with the National Gallery of Ireland (NGI), Junior Cycle Art students will visit two cultural institutions: the IFI in Temple Bar, and the newly refurbished National Gallery on Merrion Square. Through a film screening at IFI (The Red Turtle) and study of artworks at the NGI, students will be invited to question the works seen as well as respond to the spaces in which they are exhibited. This wonderful programme of short films is not to be missed. There’s a Russian story about a baby deer learning to sled, a gorgeous Irish animation about the power of imagination, and much more. All animated and dialogue-free. Careers in Film Day is an innovative one-day programme of events aimed at second-level students who are interested in working as part of the film industry. The day will offer insights into the diverse range of film professions, while academic staff and students from college courses will be on hand to offer guidance and advice. Buy tickets. For booking and more information, please email schools@irishfilm.ie (if you experience any difficulties when emailing, please call Dee Quinlan or Richard Fallon on 01 679 5744 to book).